Slippers. Description: pair, light blue kid with colored embroidery, tiny heels. History: Belonged to Mrs. Will Parsons of Thomaston, Maine, great grandmother of Louise Adams Easton. 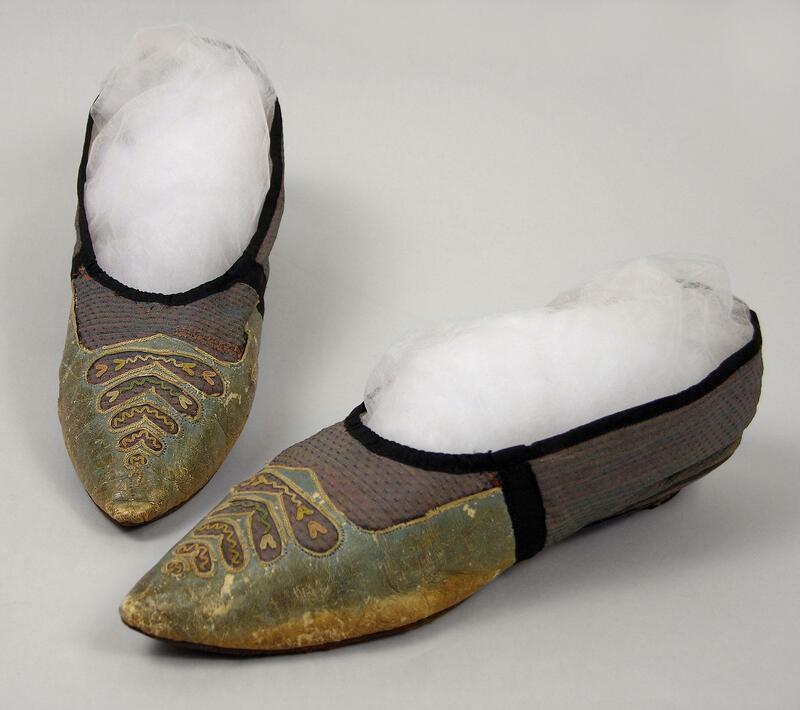 They were worn by Mrs. Parsons when she danced with George Washington at a ball given in his honor by General Knox (first U.S. Secretary of State) at the Knox mansion in Thomaston, Maine. Nancy Rexford: 11/7/91: Unusual shoe in that the kid does not go all the way around. Two layers, blue kid over shot dot silk. 1804-5 in French fashion plates one sees loose pointed toe with short vamp. By 1810, toe is oval. 10/26/95,Joan Severa: Agree with date, because of the pointed toe, which was not far into the 19th century.